It was a joy to see Osel Hita welcoming His Holiness the Dalai Lama to Melbourne this June. The young and old generation met, which formed part of his message to the press a few hours later: “My is century gone,” he explained,and the new generation now needs to amend the problems left behind by the older generation. On June 9, 2011, popular Australian footballer Harry O’Brien introduced His Holiness to the religion that is “Aussie rules football” by presenting him with one of Australia’s oval shaped footballs and Harry’s Collingwood team guernsey. His Holiness spent some time on stage with Harry, examining his dreadlocks and asking about his African and Brazilian heritage. His Holiness then gave Harry an exquisitely intimate long hug, with Harry’s head slowly falling closer to the Dalai Lama’s. His Holiness was in Melbourne for a three-day teaching on Shantideva’s A Guide to Bodhisattva’s Way of Life from June 11-13. For the first time, the teachings were streamed live on the web. An amazing 32,000 people watched the teachings live online. Six thousand people attended the public conversation on the Saturday, with another 5,000 watching live on a giant screen in the city. This year, it was heartening to read an editorial of one major Australian newspaper encouraging our Prime Minister to meet His Holiness, saying, If she recognized then (on a previous visit to China, where she brought up human rights) that the lure of export revenue must not blind Australia’s leaders to the nature of China’s authoritarian system, she should show the same resolve here by meeting the Dalai Lama. It would not only show respect for him, but for ourselves as well. 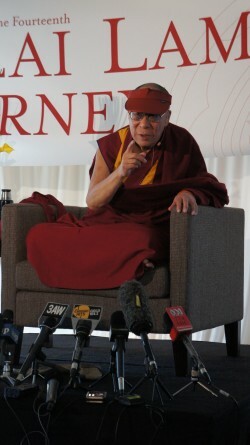 His Holiness talks to press in Melbourne, Australia, June 2011. Photo by Damien Busby. However, 90 Australian Members of Parliaments and Senators joined His Holiness for over an hour at his Parliamentary Reception. There was also an interfaith Prayers for World Peace event and a lunch meeting with members of the AustralianAll-Party Parliamentary Group for Tibet. In the past, His Holiness has said that he would like to do a long retreat, but that his responsibilities prevented him from doing so. However, having recently handed over political power, His Holiness plans to do a three-week retreat next year after some teaching commitments. He says he doesn’t intend on doing a longer retreat because as long as people are interested in hearing him teach, he regards it as his duty to keep teaching. “My visit, different cities, not for shopping, not for sightseeing,” he said.